Us Aussies love a bad guy and we love an underdog, so you can imagine how much we love a bad guy-underdog. One of our most notorious underdog-baddies, Ned Kelly, was hanged in November 1880 after a violent confrontation with police. Before being shoved off the little platform Kelly coined the phrase “Such is life.” To this day it is tattooed on footballer’s torsos, printed on bumper stickers and more recently uttered by annoyed housing investors. Kelly famously wore home made armor during his last shoot out. Despite trying to be scary, he looked like a kid wearing a mailbox and a barbecue plate. Some consider Kelly to be a symbol of Irish resistance against the bossy rich guys, however most of us just love the fact that an amateur blacksmith wearing a drinking trough could not be shot by the police. Nowadays the small town of Glenrowan between Melbourne and Sydney is cashing in on it’s most famous son. 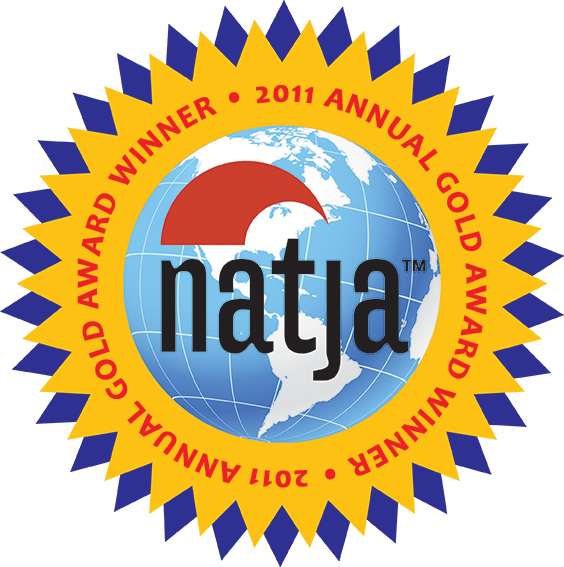 Gift shops abound, there is a forgettable animatronics display and a great museum with all you need to know about Ned…Umm, Yeah, he lost. Penguin is a small coastal town on the Northwest coast of Tasmania. Ronald Campbell Gunn was one of the first residents of Penguin. He was a botanist and one hell of a modest guy. So modest that when they gave him the honor of naming this tiny portside town, he named it after the penguins which abound along the coast, instead of himself. 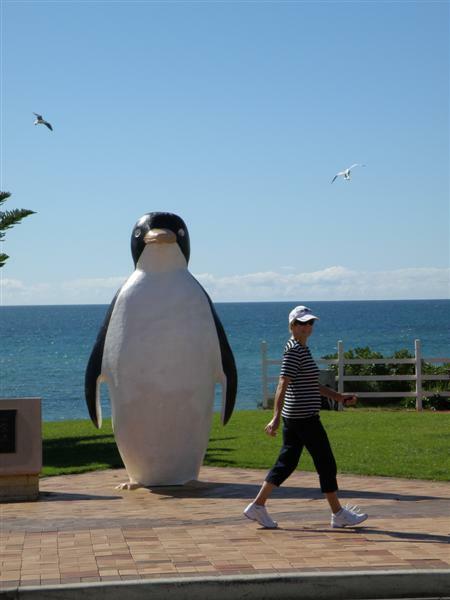 This massive concrete penguin is joined by numerous medium sized fiberglass penguins, as well as penguin-shaped garbage bins around the town. In hindsight, it’s a good thing that Gunn didn’t name the town after himself. A big statue of a be speckled, wild-haired botanist is no competition for a large penguin standing to attention. I assume that at some point in your life you have seen a cartoon of that whirling dervish “Taz,” the Tasmanian Devil. 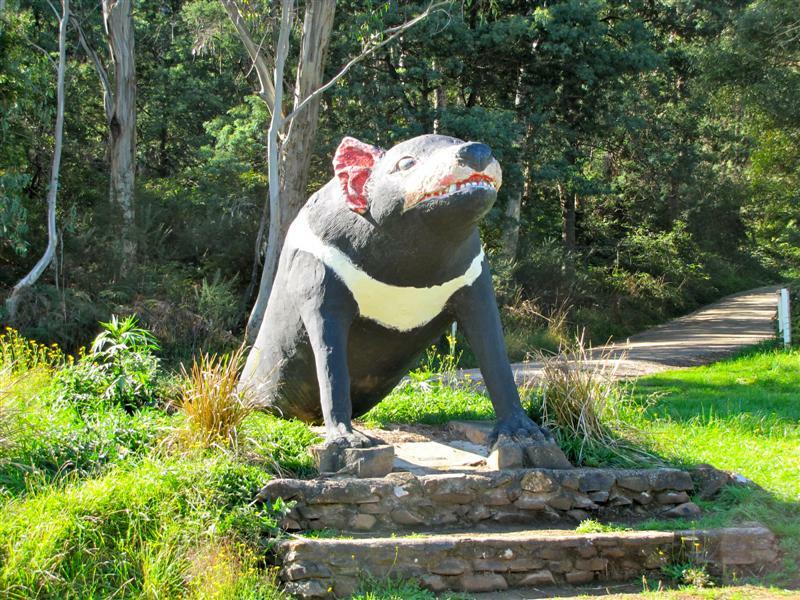 Jette and I were passing the Trowunna Wildlife park when we spotted the world’s largest Tasmanian Devil. In reality, the existence of the native population of Tasmanian Devils face a huge challenge in the next few years — the Facial Tumor Disease. In recent years, a transmittable form of facial cancer has sprung up, and these lovable scavengers are facing quick extinction if we cannot find a cure. Trowunna Wildlife Park is part of a captive breeding effort to deepen the genetic pool in the population so that the tumor will slow down. Ben, thank you for sharing all these interesting BIG highlights. Hope to hear about more BIG attractions in the future from Australia. It was my pleasure Terry. Will certainly keep my camera ready on the way home! Awesome! I so want to road trip Australia some day to see all of the quirky roadside attractions in Australia! Mate, you head up the eastern seaboard there are hundreds of funny big sights around every corner! 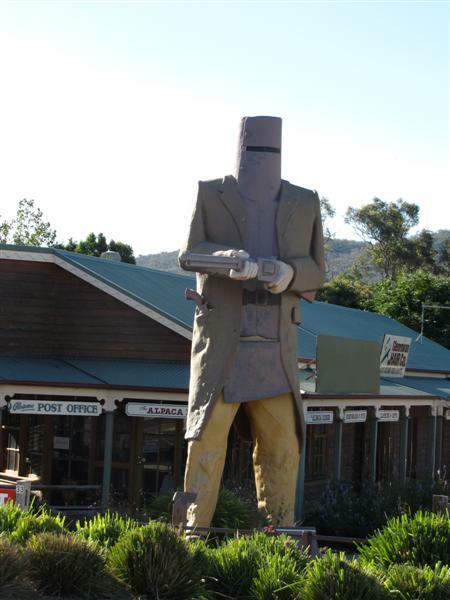 That Ned Kelly statue looks awesome. That’s why I just added Glenrowan to my place I would like to see. Sadly we did not time for the animatronics! 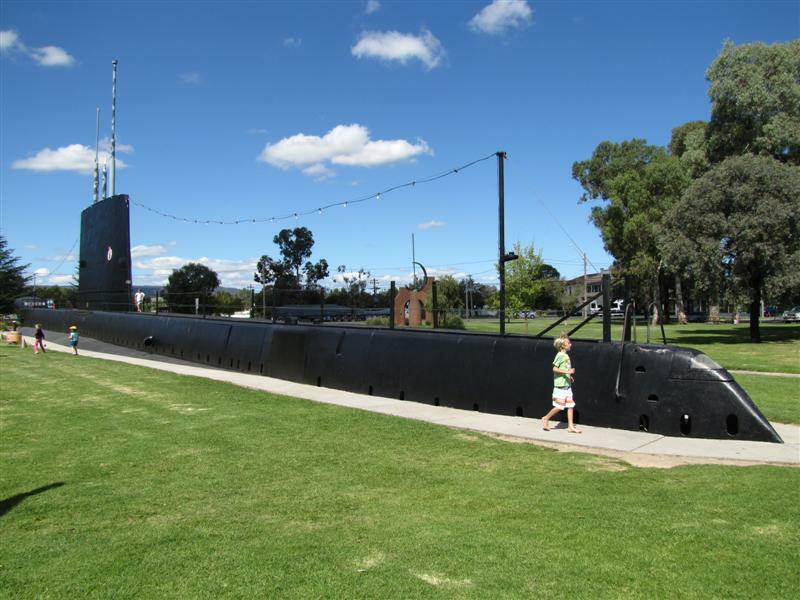 Hope you will be coming down to Tasmania again – check out just one other highlight we stayed at last year – it is a jewel! Your first post from down under. Very fun! I think that we should request a follow up post once he completes his journey. Cheers Mike, will keep my eyes open for big things on the way home. Sadly I am not heading further north where there are heaps! So cute! My kids will love those statues! Awesome article! We’re planning our first trip together to Australia in about three months and can’t wait to get there ourselves. Thanks Sarah. Hope you enjoy it over here…at least the weather will be improving by the time you get here, maybe! Very nice photos mate! I never done a road trip before, hopefully one day I can manage to make it.